Rendered: Is This Chevy’s Cousin To The Buick Encore? Even though they’re less efficient, have subpar handling characteristics, and are actually not as safe as their hatchback and wagon counterparts, crossovers seem to be all the rage these days. So we’d be surprised if you haven’t yet heard about the forthcoming subcompact Chevy crossover that will share the Gamma Extended platform with the Buick Encore/Opel Mokka. While the name and availability are unknown at this point, we were able to get our hands on the rendering you see here. The vehicle seen here looks tremendously similar the patent drawings discovered last week — which look almost identical to the Encore and Mokka. That said, we’re certain that this Chevy crossover will have inferior NVH levels and lower-grade materials than the Encore. In the meantime, we’ll keep our ears to the proverbial ground on this one, but what we do know so far is that this ute will be to the Encore what the Cruze is to Verano/Excelle. This would make a great rival to the Ford EcoSport B-segment crossover — which isn’t planned for North America as of this writing. 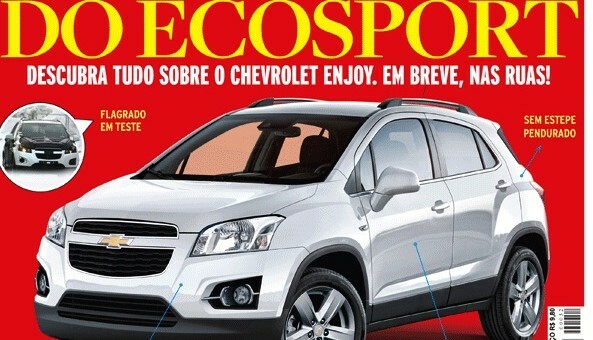 As such, this subcompact will slot in under the Chevy Captiva in markets outside the United States. Hunter you know you want one; your right though, when you have Kia raising the bar with the Sportage and Hondas next CRV, this looks silly and outdated. Is this what jd meant when he said would have unsurpassed styling when it came to crossovers? Are you okay, jd? he said midsize crossovers, he meant the next gen equinox and its buick and gmc twins. @Yab this is going to be several thousand bucks less than the Sportage and a whole size class below other compact crossovers. When JD referred to the styling, he wasn’t referring to this car but to the new compact architecture. I think the guys at GMA wrote about it a month ago or thereabouts. GM is nuts. Why don’t they bring back the Saturn folks and really do Chevrolet correctly? Until they do I am not buiying that GM junk – left over 90’s engineering with no vision. I don’ t like the Buick Encore’s design & have never been a fan of their “waterfall” grill design. I drive an ’07 Audi A3, but don’t like the Audi Q3 design and Audi has no plans to import the next A3. Yet the new Chevy Trax’s design intrigues me. Guess there’s no GM vehicle in my future unless Caddy plans to introduce a sibling to the Trax.